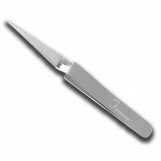 Making this a perfect tool for holding your fabric or thread without having to keep the pressure on the tweezers. Sewing, Quilting, Applique, Embroidery, etc..
A great tool for threading your needles, and machines. Forged from the best German stainless steel.